Planar Systems, Inc. and BrightSign, LLC, announced their recent collaboration to create the Planar Mosaic Architectural Video Wall. The installation was unveiled in early November at a high-end Miami-area hotel as part of its grand opening festivities. This new hotel is situated in Surfside, Florida, nestled between Miami Beach and Bal Harbour. Florida-based CMA was commissioned to install a towering four-story video wall in the reception area. CMA surveyed vendors across the entire digital signage spectrum and ultimately decided to feature BrightSign digital signage media players and Planar Systems displays. 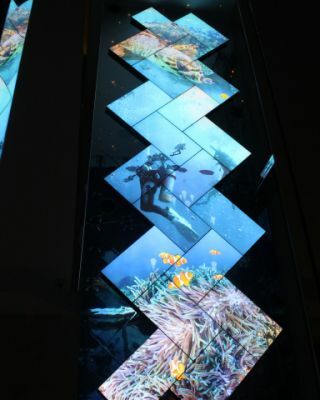 The Planar Mosaic architectural video wall solution allows the ultra-thin LCD display tiles to be mounted in any position relative to one another. This makes possible the towering video wall in which the twenty 55” displays are placed at a 90-degree angle to one another, creating a herringbone pattern. The displays’ unencumbered positioning flexibility, off-board power supplies and imaging software enabled CMA to design and install the video wall in such a way that simply would not have been possible using displays from any other manufacturer.